Recently I've had many people on Instagram asking where I bought these lamps, but the truth is - I made them! This was a project I worked on last summer before moving into our new place in Toronto. I never got around to posting the instructions on how to make them, but finally I am going to! 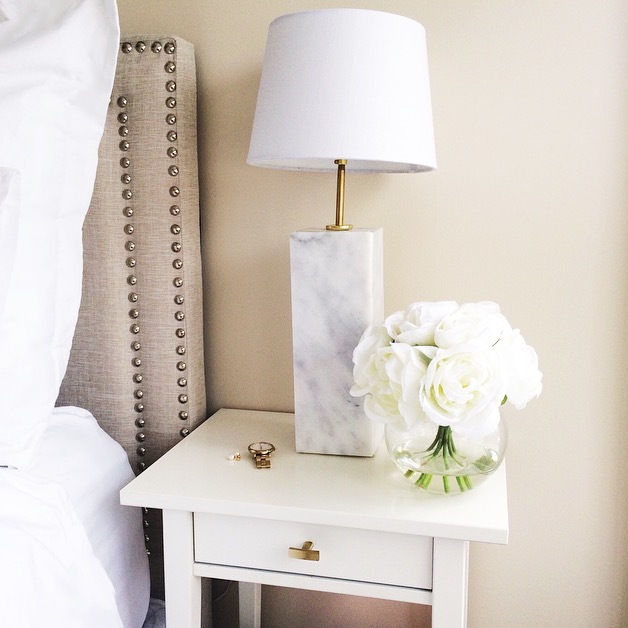 Two of these lamps can be made for under $100 total using marble bathroom tiles and a lamp kit. ** Sandpaper is also great to smooth the edges, there are some good sites out there that recommend the grit to use and help polish the edges a bit. NOTE: If you sign up for emails at Lowes, you can get $10 off your purchase! 4 of each of the below are required to make 2 lamps. 2 pieces of each per lamp. 3 1/2" x 12 "
First step is to get the pieces of marble cut, either cut them yourself, or get someone to cut them for you. In the US I heard that you can have the pieces cut for you at the store, here I had issues doing that, and had a handy man cut them for me. It is really important to measure and cut perfectly because these pieces all need to fit together. I sanded down all the edges once the pieces were cut. I then used the drill bit to drill one hole in two of the 3" x 3" square, in the centre. This is for the lamp wiring to come through. The other hole needs to be drilled near the bottom of two of the 4 1/4" x 12" pieces, this is for the wiring to come out and plug into the wall. 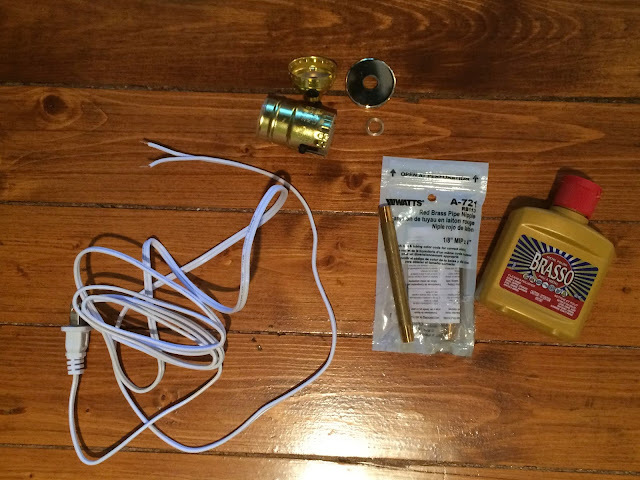 These are the pieces that you should have for one lamp. Try to be very neat and tidy with this. The glue dries a bit yellow, and I regret not taking my time. 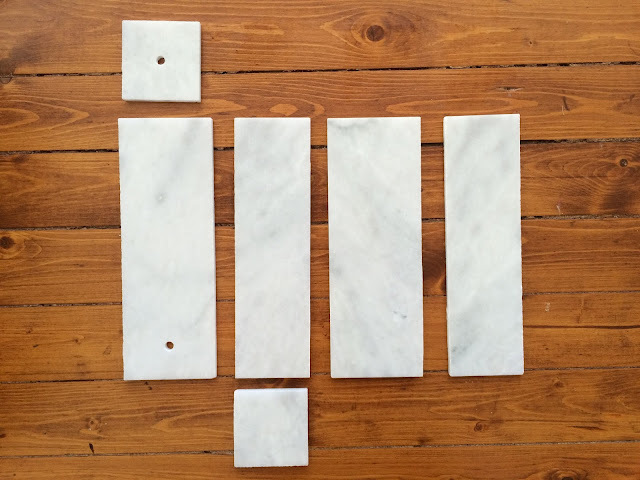 Use a mat/towel to put the marble pieces down on, so that they don't scratch! I lay the back 4 1/4" x 12" piece with the hole piece down, then this is a tricky part, glue the top 3" x 3" piece with the hole and the two 3 1/2" x 12 " pieces on the side to the back piece. The reason why the smaller pieces go on the side, is because we want the part facing out to look the cleanest with no glue lines. See the above photo for clarity, as it is a lot easier to look at than explain! Follow the instructions on the glue tube for dry time. Next we are going to work on the light! Once the marble glue is dry, we need to follow the instructions from the lamp kit - I promise it isn't very hard! Now before you go and connect all the wires, they need it run through the base. Through the hole in the back of the 4 1/4" x 12" piece and up through the top 3" x 3" piece. This is where I ran into trouble, because I needed something to raise the light higher. This is where I got a brass pipe, and used Brasso to shine it up! Beware, it doesn't smell great! 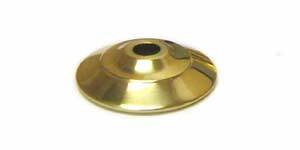 With a rag, rub the Brasso onto the rod until it becomes shiny. I then fed the wire again through this pipe. Over the pipe, I added a gold "cap" with a hole that came with the lamp kit. The reason we add this piece is just to cover the pipe going into the base. Also because the pipe I used has threads on both ends, the threads would show without the cap. Once this is all finished, we can set up the lamp kit as per instructions, again it isn't that hard. There are also YouTube videos out there that can help. Once you know that the light is working, glue the bottom rod to the marble to make sure it stays in place. Make sure it is straight. 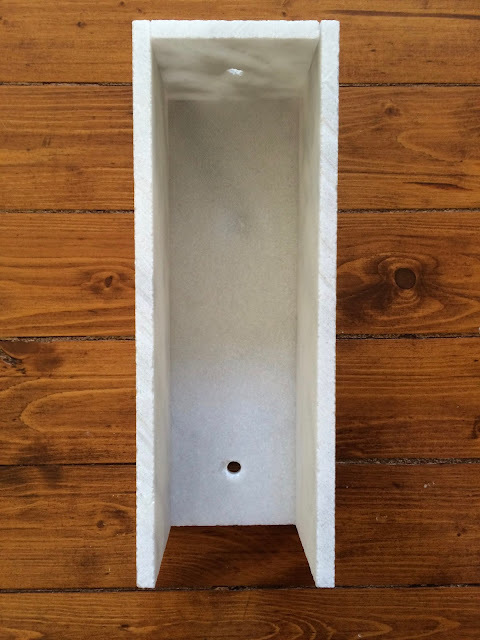 The bottom of the light fixture has a screw that will tighten, and help attach the fixture to the rod. Excuse all the mess in the photo above! Finally, glue on the bottom 3" x 3" square, and then the front 4 1/4" x 12" piece. 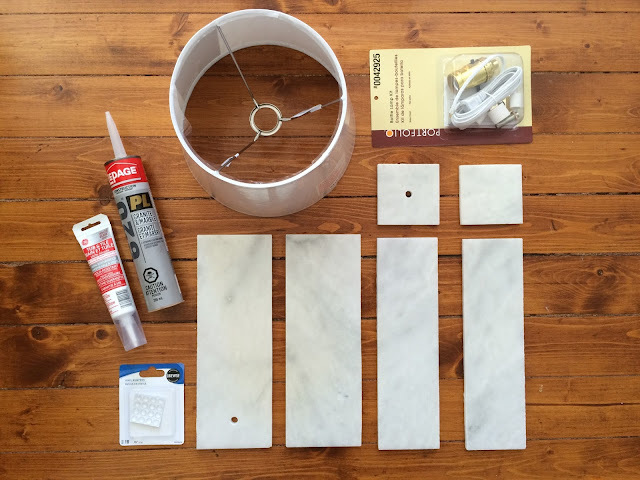 Once the glue has dried, add the caulking to help seal any gaps where the pieces of marble meet. This tray I was able to make with the leftover tile! I cut a square base, and 4 strips that were glued on top of the base. Square base: 8 3/4" x 8 3/4"
4 Strips: 1" x 8 3/4"
Blue light is destructive in light of the fact that it's the most elevated vitality wavelength of noticeable light.